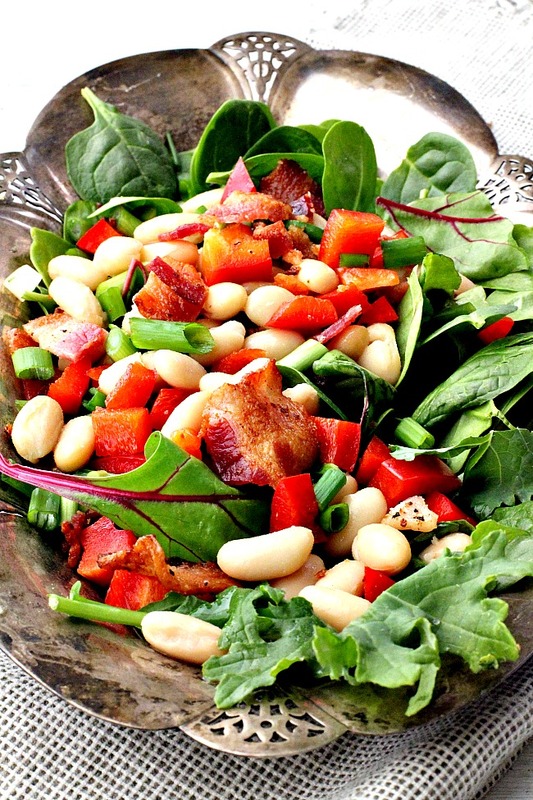 Spinach, white bean, bacon salad with a tangy maple syrup vinaigrette. Here’s a great little salad recipe that you can add to your summer repertoire. Simply delicious and it comes together in a snap. 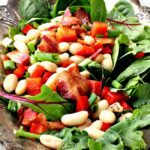 The warm maple syrupy sweet and tangy dressing melts into the spinach, turns the beans into royalty and is a natural partner for the bacon. I don’t know about you, but when I have pancakes or waffles, I always drag my bacon or bite of sausage through the maple syrup. Such a wonderful combination for the taste buds. The green onions add a nice touch to the flavor and the red bell pepper a crisp splash of color. The best part about this salad is that the next night you can have BLT Sandwiches with the rest of the bacon left in the package. Give this one a try, I don’t think you’ll be disappointed. A wonderful entree salad recipe for a light Summer meal. Combine first 6 ingredients in a small microwave safe bowl, stirring with a whisk; microwave at high 1 minute or until hot. Place beans in a two-quart glass measure, microwave until hot, one minute. Combine onions, bell pepper, bacon and spinach in a large bowl. Add syrup mixture and beans. Toss well to combine. Serve immediately. It looks delicious. With a family get together coming…a perfect time to try it. Oh, I can tell that I am going to love this! I’ve always loved the maple syrup and butter or maple syrup and bacon combo. The sweet and salty just can’t be beat! Love this salad! I am also intrigued by the vinagrette. Otherwise it reminds me of my favorite salad at the local trattoria. I am SO going to make this! Yes, did I hear Maple syrup and bacon? I am in! 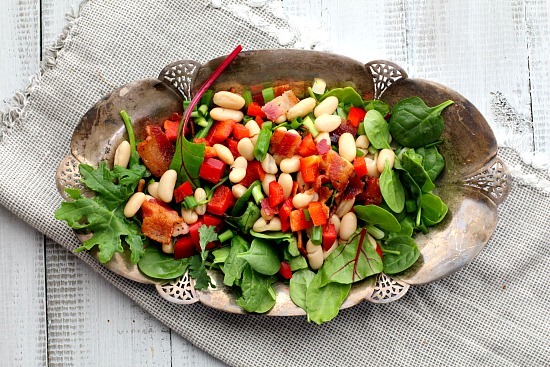 This looks delicious–I love beans the maple syrup dressing sounds great and of course BACON! 😉 Let me know if you want to send it to Souper Sundays. I’m pretty sure I’m in love with this dish and I haven’t even tried it. Maple and bacon on a salad with some beans to add protein?? Genious!! This looks like the perfect salad for tomorrow’s Father’s Day BBQ. I love the maple vinaigrette. With the cider vinegar, I’d like to make this with a little bit of pulled pork instead (or in addition to) the bacon. Yum! Yum Yum!!! 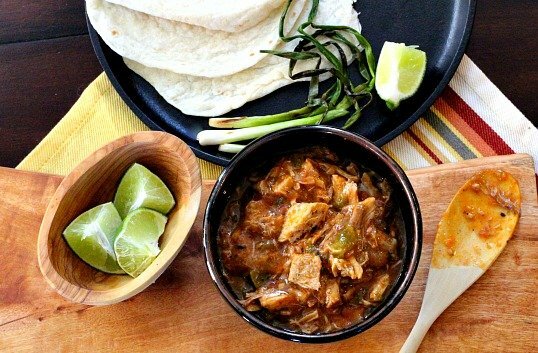 Hearty and light and delicious! Wonderful salad. This is a delicious meld of flavors with some of my favorite things! The maple vinaigrette really makes it special! I love that your families are connected through the dogs! Dogs are seriously the best unifiers out there…they just bring people together. This is one excellent meal. That strawberry pie has me drooling. 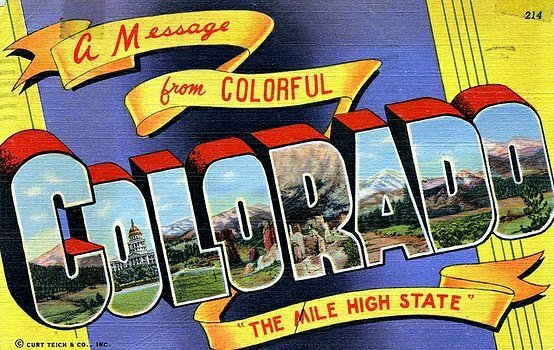 And don’t even mention the sliders. They go without saying. This looks really good. I would have never thought to make a maple vinaigrette. Great idea. I tried this tonight! I made only one serving just for me and it is wonderful! I will be posting about it AND making more! Thanks!